Feed them a good quality, balanced food and take the dogs for a walk of course! There is a confusing variety of parasite control products on the market. Here a summary of the more popular ones. Avantix– kills fleas the fastest, repels flies and mosquitoes and should be used every 3-4 weeks. Use Program tables as Advantix/Frontline will wash off. Preventic/Seresto collars for ticks can also be used for dogs that get wet often. Dipping can also be done weekly. When using topical treatments make sure you do not under dose especially on larger dogs. Flea control is not a once off treatment. 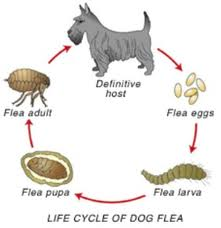 There must be follow up treatments due to the fleas life cycle. 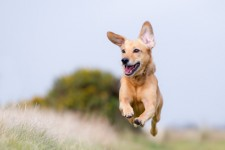 If dogs seem irritated at the base of tail it is usually a flea issue. Dogs that eat a flea can get Tapeworm therefore also de-worm dogs 4-times a year with a good product like Milbamax. s we get in to summer ticks and fleas start becoming more prevalent, especially here in the coastal regions. Fortunately a new alternative to topical treatments for flea and tick control that lasts 8 months is now available for those who forget to keep up with the monthly treatments. 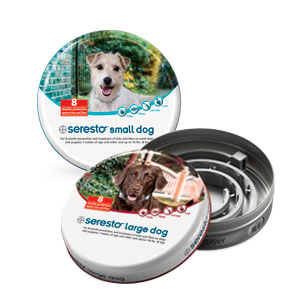 Seresto® effectively kills fleas and repels and kills ticks. With eight months of continuous protection, Seresto® helps you avoid the hassle of remembering monthly applications. It is also odourless, non-greasy and easy-to-use. REPELS and KILLS ticks for 8 months – if a tick is repelled or killed, it cannot attach to a dog and transmit organisms that may cause disease. What vaccinations should my puppy receive and when? At 6 weeks of age – distemper measles and a parvovirus vaccine. Again 3 weeks later against distemper, hepatitis, kennel cough, canine parvovirus and leptospirosis. Combination vaccines are available and the exact programme will depend on the brand of vaccine the veterinarian uses. What vaccinations should my kitten receive and when? Kittens should be inoculated at 6 weeks of age. A simultaneous vaccination against snuffles, rabies and cat ‘flu can be administered. These vaccinations require a booster 3 weeks later and should be boosted on an annual basis. Do I need to administer flea control all year round or just in summer when the fleas are really bad? You should administer flea control all year round to break to flea breeding life cycle. You do not want to allow for a untreated window period for fleas to breed and lay eggs. One flea can lay thousands of eggs. In summer the fleas seem out of control. What should I do? Keep your pets on a strict flea control programme that takes into account your pet’s lifestyle. Keep bedding clean and bath your dogs weekly.